Speech/Language Developmental Milestones - Capital Area Speech & O.T. When do kids begin talking? Should I be worried? “Parents should take children for a speech evaluation any time they’re concerned,” says Diane Paul, PhD, Director of Clinical Issues in Speech-Language Pathology at the American Speech-Language-Hearing Association. 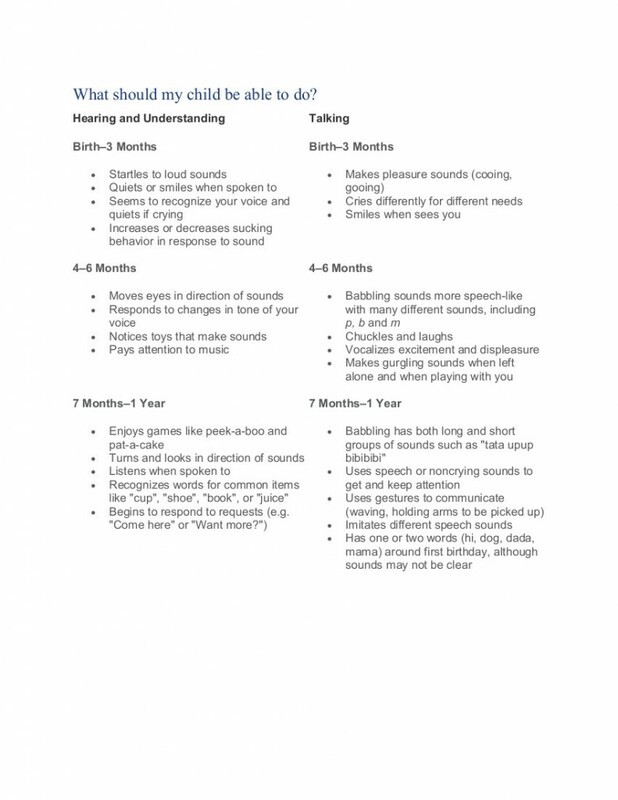 Check out the American Speech Language & Hearing Associations’ developmental chart below to see if your child is on track. 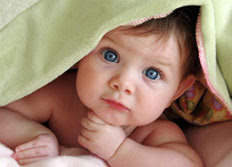 •Check your child’s ability to hear, and pay attention to ear problems and infections, especially when they keep occurring. •Reinforce your baby’s communication attempts by looking at him or her, speaking, and imitating his or her vocalizations. •Repeat his or her laughter and facial expressions. •Teach your baby to imitate actions, such as peekaboo, clapping, blowing kisses, pat-a-cake, itsy bitsy spider, and waving bye-bye. These games teach turn taking that is needed for conversation. •Talk while you are doing things, such as dressing, bathing, and feeding (e.g., “Mommy is washing Sam’s hair”; “Sam is eating carrots”; “Oh, these carrots are good!”). •Talk about where you are going, what you will do once you get there, and who and what you’ll see (e.g., “Sam is going to Grandma’s house. Grandma has a dog. Sam will pet the dog.”). •Talk about colors (e.g., “Sam’s hat is red”). •Practice counting. Count toes and fingers. •Count steps as you go up and down them. •Teach animal sounds (e.g., “A cow says ‘moo’”). This developmental chart is taken from the American Speech-Language-Hearing Association informational handout How Does Your Child Hear And Talk? Questions or concerns? Contact us at 512-250-8706 or admin@capitalareaspeech.com We are here to help! We look forward to talking to you!